RST Chair Message Welcome to the Autumn edition of Te Kakara, our Raukawa pānui. I hope everyone has had the opportunity to enjoy plenty of whānau time over the summer months and has had the chance to take some time out to relax and recharge for the year ahead. lready it has been a busy year for our kaimahi and trustees as we have got on with the many areas and mahi that our iwi is involved with, some of which is covered off in the following pages. It was wonderful to see a number of new as well as familiar faces at our AGM late last year where we announced another year of surplus growth and achievement for our iwi. It is always humbling to share the firm and considered steps and achievement our iwi is making across the many areas it is involved in from social services, to environmental development, language revitalisation and cultural support, to our commercial entity Raukawa Iwi Development Ltd. For the 2017-18 financial year Raukawa generated revenue of $11m, and a surplus of $5.4m, with around half of the surplus distributed to the Raukawa Settlement Trust to fund operations, and Marae, Education and Kuia and Koroua well-being grants, with the remainder reinvested into our commercial company to support the continued growth of the asset base for this and future generations. Alongside the financial reporting, the RCT Group Managers also presented a range of highlights from each of their business groups, which was well received. The AGM is a wonderful opportunity for whānau to reconnect and share in the success and progress of our iwi, and to see the progress and achievement across our iwi organisation. This year’s AGM will be held on the first Saturday of December, and I look forward to seeing as many of our whānau as possible at the hui. Connection, collaboration and commemoration were on show for a week of activities held across the South Waikato community to commemorate the signing of the Treaty of Waitangi. The week-long series of events, in its fifth year, is the result of a collaboration between the Raukawa Charitable Trust, the South Waikato District Council, the South Waikato Pacific Islands Community Services, Toi Ohomai and Te Wānanga o Aotearoa. The festival is covered off in greater detail later in the following pages. These are just some of the stories in this edition of Te Kakara. I encourage you to take some time out to take in the wonderful mahi and achievement of our whānau, and to stay informed on some of the key happenings and achievements for Raukawa over the last few months. From left: Laurie Hema, Fraser Whineray, Nigel Te Hiko, Gavin Williamson. On the 14 December 2018, the Raukawa Charitable Trust conducted the blessing of the newly refurbished office facilities at Maraetai Dam. In a lowkey ceremony, Raukawa kaimahi Nigel Te Hiko led the blessing with Mercury senior management and staff. The offices were officially opened by Fraser Whineray, Chief Executive, Mercury. Don Scarlet, Mercury Key Relationships Manager says “It is important that when we open these new offices that we acknowledge and recognise the mana whenua within this region. We are delighted and honoured to have Raukawa here as the mana whenua.” In response to a question regarding the process of the karakia, Nigel explained “Think of the karakia as opening a dam, transferring the awesome energy (the mauri) of the river and creating electricity or as we see it, the manifestation of wairua.” Construction of the Maraetai (I) dam commenced in September 1950 and began generation in October 1952. Maraetai (II) was the last powerhouse to be built on the Waikato River. RST Chair Vanessa Eparaima presents at the 2018 AGM. On Saturday 8 December Raukawa uri gathered at the South Waikato Sport and Events Centre for the 2018 Raukawa AGM. he AGM was a chance for Raukawa to report on another successful year. A year that saw the group generate revenue of $11m, and a surplus of $5.4m. Around half of the surplus was distributed to the Raukawa Settlement Trust to fund operations, and Marae, Education and Kuia and Koroua well-being grants. Of the $695,000 budgeted for these grants, over $520,000 was distributed in this financial year, with the remaining funds awaiting the completion of reporting by marae. The remainder of the surplus was reinvested into the company to support the continued growth of the asset base. The asset base of the iwi continues to grow, increasing from $132m to $146m, capping off another year of solid performance and the sixth year of surplus since Raukawa Iwi Development Ltd was launched in 2012. RCT Tumu Whakarae Maria Te Kanawa. Alongside the financial reporting, the RCT Group Managers presented a range of highlights from each of their business groups. RCT Business Group Manager Grant Kettle presents at the AGM. "We have seen continued growth and achievement across our entities. This is a testament to the good work, shared values and communication across the RST, RCT and RIDL." For the fifth year in a row the South Waikato community came together to commemorate the signing of the Treaty of Waitangi. he signing of the Treaty of Waitangi was an event that had a profound effect on tangata whenua, and which resulted in massive change for our people. Once again, the commemorations continued to grow in size and scale, reflecting the importance of the Treaty to all in our community. The commemorations kicked off on Waitangi Day with a morning karakia at the summit of Colsons Hill, followed by a shared breakfast at Te WÄ nanga o Aotearoa. This was followed by a well-attended quiz night on Thursday night. The weeklong festival culminated on Saturday, February 10 with the Festival of Cultures held at the South Waikato Sport and Events Centre in Tokoroa. The week-long series of events is the result of a collaboration between the Raukawa Charitable Trust, the South Waikato District Council, the South Waikato Pacific Islands Community Services, Toi Ohomai and Te WÄ nanga o Aotearoa. This year saw another strong turn out of locals and visitors who had the opportunity to enjoy live music, cultural performances, childrenâ&#x20AC;&#x2122;s activities and a range of kai and crafts that showcase the diverse cultures of our community. The week of events has become firmly established as a regular feature of the year for the whole South Waikato community. 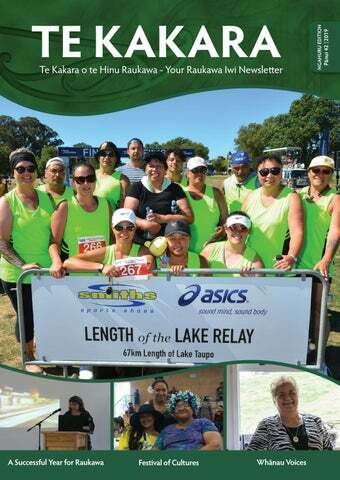 s dawn broke across Lake Taupō on the morning of Feburary 16, fifteen RCT kaimahi, trustees and whānau, along with thousands of other participants, were preparing for the start of the Length of the Lake Relay. The 67km course starts at Pūkawa on the south west shore of Lake Taupō, and finishes in the heart of Taupō township. This annual event helps raise funds for The New Zealand Breast Cancer Foundation. This is the 6th year that Raukawa have taken part. This year Raukawa was represented by Raukawa Kia Mau and Raukawa Kia Ora teams, who both completed the course in a time of 9 hours 1 minute and 47 seconds. Whānau Voices - Rina Lawson “I am bonded by the river and the river is me” Rina Lawson. As a means of documenting the positive impact that our services have on our whānau and community we produced Whānau Voices. Whānau Voices tells the story, in their own words, of six clients from across the range of social services RCT offers. Here we present one of those stories. 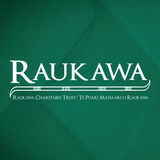 hile living in Tauranga I became a board member for the Raukawa Settlement Trust, as the representative for my marae. I returned home to Putaruru in 2015 and was invited by my sister to join the kaumātua group. I have been on hīkoi, enjoy the Tai Chi movements, indoor bowls, and picking pūhā; to name just a few. The 2 hour waiata sessions are “lively” and are “very varied”(chuckle). I attended the last Kaumātua Olympics and though totally exhausted at the end of the day, I thoroughly enjoyed it. I am looking forward to the first Kaumātua Games that are being organised by Raukawa, because it will be for uri of Raukawa. The kaimahi provides a wide range of different activities, adjusts well to the change of weather conditions, and involves everyone. I am also enrolled in the clinical nurse’s services. The kaimahi team are the true meaning of manaakitanga and always seem to be available when I have a question or concerns. I strongly encourage others to become involved. Just go along and have a look. I also enjoy being involved in the Pūtake Taiao (Environment) Team. The paru that contaminates a stream which eventually feeds into my river affects the wellbeing of my people. I place myself in a space that benefits my marae, my river, my iwi. This included participating in the recent Tōtara Legacy Project, that in 120 years’ time, what I did today will benefit future generations. Kuia and Koroua Wellbeing Grants “As pensioners, we are grateful for the financial support that we get from Raukawa,” says Colin. Applications for the 2018-19 round of Kuia and Koroua Wellbeing Grants are now open. These grants are offered to support kuia and koroua in living active, healthy, fulfilling lives, and allow them to continue to contribute to and engage with their communities. Kuia and Koroua Wellbeing Grants are open to registered iwi members 60 years and over. uia and koroua can apply for up to $1000 towards the cost of wellbeing and healthcare such as eye, dental, hearing, and podiatry treatments, GP visits, pharmacy prescriptions, and mobility equipment. Grants can also extend to heating needs and ambulance fees. Kaumātua Colin Barnett has whakapapa links to Pikitū Marae and Ngāti Huri. He has applied for and received a grant for each of the last four years. These grants have helped Colin pay for hearing aids, dental work and prescription glasses. In addition, they have assisted with costs incurred following both an in-home accident that left him requiring a wheelchair for two months, as well as hospital stays for eye surgery and pneumonia. Colin and his wife lead active lives, and at 73 and 72 they try to be as independent as possible. “As pensioners, we are grateful for the financial support that we get from Raukawa,” says Colin. “I am a mad keen veggie gardener, I also love both salt and freshwater fishing. We both try and spend as much spare time as possible with our mokopuna. Thank you Raukawa for helping make this possible.” Raukawa makes a strong commitment to give back to our marae and iwi members as we prudently administer our settlement funds. Photo caption: from left, Vicky Robertson (Secretary for the Environment), Dylan Thomas (RCT Intern), and Kelly Palmer (Manager, Mana Taiao). Dylan Thomas from Ruapeka marae was the recipient of the 2018-19 summer internship with the Ministry for Environment (MfE). This internship is provided on an annual basis as part of the Raukawa Settlement Trust Ministerial Accords. Dylan is 18 years of age and resides in Dunedin with his whānau and attends Otago University where he is in the second year of a BA in politics, German and Māori. He is also a New Zealand and Māori representative hockey player. ylan’s application stood out for reasons that include his aptitude for environmental policy and his desire to learn more about how these policies impact on iwi. Additionally, he was also chosen because he regarded this opportunity as a way to reconnect with his ancestral marae in Ruapeka. Dylan’s internship saw him placed with MfE’s Mana Taiao team, where he has been exposed to policy development and the natural resource related redress programme. “I have been really pleased we’ve been able to support Dylan, and proud of the growth we’ve seen in his time here.” Dylan has thoroughly enjoyed his internship experience and is grateful to Raukawa Charitable Trust for providing this opportunity. Kelly Palmer, Manager for Mana Taiao says “I have been really pleased we’ve been able to support Dylan, and proud of the growth we’ve seen in his time here.” Dylan’s internship with MfE finished on Friday, 8 February 2019. For RCT Dylan’s recruitment is an important initial step in fulfilling the organisations succession planning aspirations. Through key partnerships and high-level relationship documents like the Ministerial Accords, RCT are able to provide a practical employment pathway that reconnects rangatahi uri back to Raukawa whilst also providing them with the appropriate capacity and leadership development training that will enable them to apply for future leadership roles within Raukawa. Get your FREE subscription to Te Kakara! Enjoy the latest news from Raukawa with your quarterly subscription of Te Kakara. If you are a registered iwi member to the Raukawa Settlement Trust, you are eligible to receive a free copy delivered to your New Zealand address. Latest News from the Raukawa Settlement Trust and Raukawa Charitable Trust.